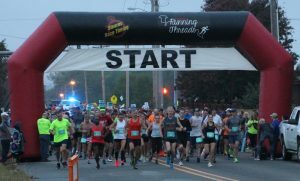 The weather was perfect for the 11th Annual Soaring Wings Half Marathon and 10K held Oct. 20 in Conway. The event benefits Soaring Wings Ranch, a Christian organization that has two homes for girls and one for boys and one home for infants and toddlers. Marla Watson and Amanda Castillo serve as co-race directors. This year’s event was dedicated in memory and in celebration of Steve Zimmer – someone who always went the extra mile for others. This year’s theme, #GoTheExtraMile, was a tribute to Steve. The overall winner of the half marathon and the first female was Tia Stone with a time of 1:25:42, a personal course record. Karl Lenser was the first male at 1:27:57. The overall winner of the 10K and the first male was Trey Turner with a time of 38:20. Linnae Magyar was the first female at 44:52. The Official Race Nutrition and Pacer Sponsor was The Sporty Runner. Other sponsors were The PI Company, Conway Women’s Health Center, BancorpSouth, First Security Bank and Centennial Bank. 501 LIFE was the official media sponsor. Between race participants, volunteers and spectators, an estimated 2,500 converged on the McGee Center, where the races started and ended. The event drew participants from throughout Arkansas as well as other states – Texas, Missouri, Tennessee, Mississippi, Oklahoma, Louisiana, Kentucky, Arizona, Wisconsin, Colorado and Nebraska. Amanda noted there was even a participant from Saudi Arabia. No major problems were reported along the race course. “We have received such great feedback from participants regarding the volunteers, course, pacers, organization, medals and race gear,” said Amanda. Renee Rader was the top fundraiser in the Winged Warrior program, collecting more than $1,500. In all, Winged Warriors raised nearly $15,000 for the children of Soaring Wings Ranch. For those who placed in their category but they were unable to attend the awards ceremony, awards are available to be picked up at The Sporty Runner at 1016 Van Ronkle St. in Downtown Conway. The awards will be available for two weeks. Next year’s event is scheduled for Saturday, Oct. 19.